There are many battles in the daily life of a believer. We have war with our own fallen nature that we are born with. Even though we are saved, we must take up this cross daily. Not only do we have to deal with our own carnality but we must deal with the fallen natures of others. Imagine a day without that. And we have war with an unseen enemy who comes to steal, kill and destroy; and with a heart to usurp the plans of God all he can. Praise the Lord that we are not defenseless. God offers us spiritual armor, not just human armor. The whole armor of God is available to us. Father God wants us safe, victorious and to be able to help others. Galatians 5:16-17 "I say then: Walk in the Spirit, and you shall not fulfill the lust of the flesh. For the flesh lusts against the Spirit, and the Spirit against the flesh; and these are contrary to one another, so that you do not do the things that you wish." This is where we must take up our cross daily and submit to the leadership of the Holy Spirit. Many people think that when we become Christians all things are made new because of a certain verse in the Bible. But the fact is, that verse in reference to "the spirit" being born again and all new. We go from spiritual darkness into being alive in spiritual Light. If we weighed 300 pounds before we got saved and wore glasses, then even though we just had a life changing, born again experience, we will still weigh 300 pounds and wear glasses even though the conversion is complete. And somehow people think that all of a sudden we instantly have the mind of Christ. The truth is that if we were truly born again, we now will have a spirit that is pure and not wanting to sin but that wants to please God. Sadly though, along with that 300 pound body, we will still have a sinful physical brain to deal with. And now the war begins. We have the Spirit of Christ in us and we need to follow His direction 100%. But the physical brain has years of programming and most of it has not been under the submission and direction of the Holy Spirit. So we need our minds renewed by God and His Word. The born again spirit also has a brain and this brain is now pure and in the Light. If you were to leave your body behind as in death or near death, your spiritual brain would go with you and the physical one would still be left there with your body. The born again spiritual person has to let the Lord retrain the physical mind and subdue the carnal nature that comes along with it. People interaction. This is a challenge too. There are always problems and issues between people. And yes, Satan can be behind issues and differences as an instigator, but I think more often than not, people naturally have differences and misunderstandings every day. Where the devil enters in, is through manipulation. He tries to manipulate these situations into more than they are. Sometimes, he might even manipulate the start-up. But to give him credit for all differences and misunderstandings is just not true. For years many of us have been taught that Ephesian 6 is the answer for all Christian battle. And we were to use the Roman soldier's battle gear for a mindset. Today, I stand against it in opposition. Paul was doing his best in trying to warn and teach us to “fight in the spirit”. He used battle metaphors, but that is all they are. What we do in the spirit, in "put on the armor of God" and it is not physical or Roman, by any means. Please read this again, even if you have read it many times. Notice how this is about "spiritual warfare" and "fighting with God's power and tools" and that the "Roman soldier terminology" is only that: terminology. Ephesians 6:10-18 "Finally, my brethren, be strong in the Lord and in the power of His might. Put on the whole armor of God, that you may be able to stand against the wiles of the devil. For we do not wrestle against flesh and blood, but against principalities, against powers, against the rulers of the darkness of this age, against spiritual hosts of wickedness in the heavenly places. Therefore take up the whole armor of God, that you may be able to withstand in the evil day, and having done all, to stand. Stand therefore, having girded your waist with truth, having put on the breastplate of righteousness, and having shod your feet with the preparation of the gospel of peace; above all, taking the shield of faith with which you will be able to quench all the fiery darts of the wicked one. And take the helmet of salvation, and the sword of the Spirit, which is the word of God; praying always with all prayer and supplication in the Spirit, being watchful to this end with all perseverance and supplication for all the saints-- "
Notice he says, whole armor of God. We are to be the warrior that is wise, obedient and mighty. That is victorious over the strategies of the devil. That is able to stand in the day of attack; not partially trained or equipped! Armed with the offensive and defensive weapons of God being strong in Him, in the power of His might to stand with truth, righteousness, ready always to share the Gospel, having faith, personal salvation, the Sword of the Holy Spirit, the very Word of God, prayed up and keeping an attitude of being prayerful in the Spirit, especially taking care to be mindful to the leadership of the Holy Spirit. We must recognize which enemies we are fighting. Sometimes we fight our own carnal nature, sometimes we have to deal with the carnal nature of others. Paul is showing us how "to stand against the wiles of the devil." We fight fire with fire and we fight spiritual battles with spiritual weaponry. And that can sometimes include our own issues and issues with others. My point is that some "spiritual minded people" want to say "everything is a spiritual battle with the devil" and that is not what Paul was saying! He is saying that we fight spiritual battles with the devil with the armor of God. We win over our own carnal nature by submitting to the Word of God, the Spirit of God. We win against the carnal nature in others by living out our faith. By the fruit of the Spirit living in us. Overcoming hatred with love and prayer. All the fruits of Jesus in us, combat the evil we face in others. For example, a soft answer turns away wrath. A smile slays a frown. Returning good for evil heaps coals on the evil person's head. Wisdom rules over foolishness. There is life in the fruit of the Holy Spirit, the fruit of Jesus in us! The fruit of the Spirit wins over the carnality of the flesh and returning good for evil empowers heaven to work in situations. To choose wrongly, empowers the enemy. So how do we stand against the wiles of the devil? Ephesians 6:10-11 "Finally, my brethren, be strong "in" the Lord and "in" the power of His might. Put on the whole armor of God, that you may be able to stand against the wiles of the devil." We must become strong in the Lord in “the power of His might.” Who is our best example on this? It is Jesus Christ. He displayed the armor of the Lord during His time as a man and in so-doing, He showed us the way. Do you remember how John recorded Jesus saying we need to be "in the Lord" and "the Lord in us?" Jesus stayed vertical with God which empowered Him to be horizontal with others. For us, we err. So we must repent quickly. And we must stay in tune to what the Father directs as Jesus did. This is not the religion of man, this is relationship with God and when we obey God on this, the devil would prefer to move on down the road. If we truly walk in the Spirit, staying close to God then His power is always at hand. Jesus knew that being in human form, the needs of people would drain Him. Many times He would withdraw from others to be closer to the Father and restrengthened so He could hear clearly and stay in will of the Father. If Jesus did that, how much more important is it for us to do it? We need to be strong in the Lord with His strength. We cannot fight any devils in our own strength! Through prayer, worship and meditation in His Word, we are re-strengthened and made fit for battle. This whole section of scripture, is about spiritual warfare; to enable us to stand against the wiles/strategies of the devil! In reading and studying, try to think about how Jesus did spiritual warfare. How did He also exhort and show us the way as He was pouring his heart out before the cross, in the book of John chapters 14 -17? Jesus is the Armor of God. All the facets of the Armor relate to Him! He has gone to be with the Father, but He sent us His Spirit and we have His Word, the Scriptures. This is a lot of ugly in our spiritual atmosphere. It sounds to me like demons, groups of demons, their commanders and armies of them. It is quite a list and a very serious enemy. We know they shoot fiery darts, trick, deceive, tempt, steal, trip, devour, harm, destroy, kill and attempt to pervert the truth and all that is holy. That devil is evil and his minions are too. Another old saying worth reminding ourselves of is: “know our enemy.” No one ever went into battle and overcame a formidable enemy without considering the enemy’s mindset, power and weapons of warfare. 2 Corinthians 4:7-9 "But we have this treasure in earthen vessels, that the excellence of the power may be of God and not of us. We are hard pressed on every side, yet not crushed; we are perplexed, but not in despair; persecuted, but not forsaken; struck down, but not destroyed--"
Same writer, same hope! Stand, even if we are hard pressed on every side, even if we are perplexed, even if we are persecuted or struck down, Stand! How do we do this? In the power of God! Not our own strength! The Holy Spirit is our Strength! James 4:7-8 "Therefore submit to God. Resist the devil and he will flee from you. Draw near to God and He will draw near to you"
How awesome is this? Who is our Daddy? We take our refuge and strength in Him! We are safe in our Lord, we are strong in our Lord. To try to take the devil on in our own strength is utterly stupid. He laughs at those who try. But to those who find their strength in the Lord, theirs is the victory! Submit to God. Then resist the temptation, lies or accusations of the devil and he will mosey off. No! He will "flee." That means run! He can't take the heat from the power of God in you when you are vertical with the Father! Ephesians 6:13-14 "Therefore take up the whole armor of God, that you may be able to withstand in the evil day, and having done all, to stand. Stand therefore, having girded your waist with truth"
Truth! It wins! Lies are dispelled in the light of the truth. Jesus listened to all the twisted questions of those who were against Him and answered in truth and wisdom. Man and the enemy wants to always twist Scripture for personal gain, convenience & a ton of other reasons. But Jesus wants the essence and truth of God's Word to be honored. The devil through the high priest slapped Jesus accusing Him of blasphemy. Both the devil and the priest thought they won that day. But they could not have been more mistaken. Jesus victory in staying true to the Mission and without sinning, saved the lives of everyone of us who would ever be saved. And one day, both the devil and the high priest will have to bow and give Jesus glory and call Him Lord. The truth always wins, no matter how it appears to the human eye. Ephesians 6:14 "the breastplate of righteousness"
What covers our heart and chest in the spirit? It needs to be Jesus with His righteousness! Because if we are uncovered, we are in grave danger! We need it to be right with God or else we become vulnerable! When we are in Christ and Christ is in us, when we are abiding in Him and He is abiding in us - this is our sweet spot! This is where we are safe. This is where we can “stand.” To be covered in Jesus' righteousness and not our own; is everything! Ephesians 6:15 "and having shod your feet with the preparation of the gospel of peace"
To have our feet moving in the preparation of the gospel of peace is huge! The gospel is for sharing! The gospel is to be received and shared! The Dead Sea is one of the stinkiest bodies of water on earth! Why? Because water flows in and does not flow out! We are not designed to receive only! We are to receive God's love and share it also! Isaiah 52:7 "How beautiful upon the mountains are the feet of him who brings good news, Who proclaims peace, who brings glad tidings of good things, who proclaims salvation, who says to Zion, "Your God reigns!" We are the ambassadors of Jesus Christ! Let us always shine and live as such and follow in the footsteps of Him who is the Way! Ephesians 6:16 "above all, taking the shield of faith with which you will be able to quench all the fiery darts of the wicked one." The original language here says “to be able to quench all the fiery darts from the past with effects still felt today”..Whew! Has your soul ever been shot with fiery arrows from the evil one? Have you ever felt “chewed up” in your heart from the evils of life? Have you ever felt shredded? This happens in the spirit, not the physical. And for the believer, the answer too is spiritual; the healing is in Christ! His Word in us, His power in us, His love in us. His wisdom. His goodness. All the fruits of the Spirit, bring good and healing. The fruit of evil tears down, hurts and destroys but the fruit of the Spirit, Hallelujah, brings life! All of the personality of Jesus Christ, is life-giving and restorative! The shield of faith is our “trust in God.” Our trust for strength, healing, power, recovery, and anything and all that we need. That are able to quench all the fiery darts of the wicked one. The healing over the past injuries in the spirit and the protection for today and tomorrow. The just walk by faith and not by sight! Faith says, we know and trust that our God is working all things for good... for us that love Him and are called according to His purpose. Faith stands on His promises! Job 1:9-10 "So Satan answered the Lord and said, "Does Job fear God for nothing? Have You not made a hedge around him, around his household, and around all that he has on every side? You have blessed the work of his hands, and his possessions have increased in the land." If the Lord had this for Job, would it not be even more available for us? It is not to say: that like Job, Jesus and the apostles, that we will not face harm... but it is to say: that NO harm can come upon us except what God allows! Or perhaps when we invite harm by making bad choices or open ourselves up for trouble. Job had found the best place! The works of his hands were blessed and he had increased. The Lord had a hedge about him and around his household, and around all that he had on every side! Job was living right! And he was blessed. He still had to face sickness and loss of family, wealth and possessions. He got frustrated when his healing did not come as fast as what he prayed for. But he had a relationship with God and God was pleased with him. God was there when he fell. And when Job repented, God was there to pick him back up. Job had a hedge! We all need that! One that surrounds us and covers us overhead and even under our feet. I believe this is found in Jesus Christ! In His covering, In Him being our Shield, our Righteousness, in trusting in Him, having faith in Him and His promises. In walking in His truth and His love, being a receiver of it and a giver of it. Ephesians 6:17 "And take the helmet of salvation, and the sword of the Spirit, which is the Word of God;"
The helmet of salvation is no doubt, the mind of Christ! To fight all battles according to Him, is our answer! I would like to propose something: Have you ever noticed how the cross resembles a sword? And did you ever notice where Jesus was crucified? Golgotha, Calvary, the place of the skull; I believe that it was no coincidence. 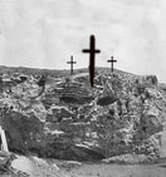 Golgotha is still there today and the reason it is called that is because in the side of the hill, it looks like a face. Where does our evil nature come from inside us? It comes from the mind! Lust, greed, pride, selfishness, etc... We are to crucify the flesh/carnal nature everyday! We are to put on the mind of Christ. Imagine Golgotha and the Cross above with Jesus on it. Imagine His blood being poured out for us there at the Place of the Skull. He came to deliver us from our evil nature. Jesus is The Word of God to us. The Bible is the Word of God to us also. He is the Word, He is the Way, He is the Truth, He is the Life. In Christ and through Him we have the Armor of God. Not like a Roman soldier, but like a Christian soldier, doing spiritual warfare with the spiritual enemy, Satan and his minions. How did Jesus set people free? How did He heal, How did He save? He said, follow Him, do what He did. He said, we will do even greater things as when He went to the Father, He was able to send His Spirit to us in order to be with us and work through us! John 3:14-15 "And as Moses lifted up the serpent in the wilderness, even so must the Son of Man be lifted up, that whoever believes in Him should not perish but have eternal life." By looking at the sin on the pole, they were admitting they needed help. We must first realize we sinned before the Lord can even begin to be our Savior. Jesus is the Word. Sin is what He took for us. When we look to Him, admitting our sin and need of a savior, we are saved; just the Hebrews that obeyed Moses and beheld that serpent on the pole and lived. The Word of God. The Word of God is like a "sword." It is no coincidence that it is spelled as such. The amazing thing about the "sword" of God, His Word, is that it is both "our defense" and it is "our offense" in warfare. We cannot utilize the Word of God as our sword, if we do not have it working in our lives and living in our hearts. We must know the Word of God. Knowing the truth sets us free and to know it, we must learn it. And in so doing, we can help others also. We can defend ourselves against the attacks of the enemy in given areas if we know the specific Scripture and its function that defends us at that point. We can attack the lies and deception, we can liberate the captive souls if we know the Scripture that specifically applies to the specific situations. It is the right use of Scripture, applied according to the leading of the Holy Spirit that will get the job done. The Word of God is alive. In Revelation (chapter 1), when Jesus is seen by John about to give His word to the seven churches, "the Sword is in His mouth". Also, later when He is on His horse (chapter 19), headed for the last battle of the Age, again, the Sword is in His mouth. A word spoken in the spirit can also be verbal. And as we hear in the spirit, so can we speak in the spirit. Verbal is secondary! You can hear God or the devil speaking to you; and another person not hear it at all and vice-versa. We can answer out loud or in the spirit. Either way, communication is being done. To do it out loud, just means that anyone else present can also hear. How did Jesus handle the devil in the wilderness when He was fasting and being tempted? The devil tried to manipulate Him and by twisting the Word of God but Jesus answered him straight forwardly with the Word of God used correctly. Jesus set the example for us. He could have just said, “bow down before me evil one. Or go, be bound in hell.” But He did not do that. He was showing the way for us. When Jesus encountered people in His ministry that were bound or needed healing, He showed us how to handle them too. Only we do it through His Name and with the Holy Spirit working through us. Mark 16:15-20 "Go into all the world and preach the gospel to every creature. He who believes and is baptized will be saved; but he who does not believe will be condemned. And these signs will follow those who believe: In My name they will cast out demons; they will speak with new tongues; they will take up serpents; and if they drink anything deadly, it will by no means hurt them; they will lay hands on the sick, and they will recover." So then, after the Lord had spoken to them, He was received up into heaven, and sat down at the right hand of God. And they went out and preached everywhere, the Lord working with them and confirming the word through the accompanying signs. Amen"
These signs follow those who do believe, not those who do not believe. And nothing is done in the power of the person; rather in the power of God, the Lord working with them. This is why Jesus went to be with the Father, so that He could then send the Holy Spirit to be with us always. He performs the Word of God. He is the wonder working power of God. He is the Word of God that does not return void. Isaiah 55:11 "So shall My Word be that goes forth from My mouth; it shall not return to Me void, but it shall accomplish what I please, and it shall prosper in the thing for which I sent it." Ephesians 6:18 "praying always with all prayer and supplication in the Spirit, being watchful to this end with all perseverance and supplication for all the saints--"
How can anything run without power? A car needs fuel. As our physical bodies need to be fueled, how important also, do our spirits need to be fueled? The filling of our spiritual tanks comes from, waiting on the Lord, prayer, praise, worship, meditation in the Lord and His Word & praying in the Spirit! Persevere and keep in prayer for ourselves and others. We need the prayers and our brothers and sisters do too. It is part of the very fiber of how the Lord made it all to work. Persevere, for we are the example for others. Lost and found. We really can do all things through Christ who strengthens us! We must be strong in the Lord to stand, to endure, to be victorious and we can do it through the strength of the Lord. By being saved, by being filled in our spiritual tanks, by being prayed up and working together as a body. We have an unseen enemy that is continuously up to no good. We must stay alert and abide in the Lord at all times, for our own sake and to be of any good to those around us. Like Jesus, we need to continuously be conscious of the will of the Father, to honor Him and give Him glory. Jesus, living as Lord in our lives, supplies us with the whole armor of God. It is up to us to accept, apply and keep the armor in use! WHERE DOES OUR SPIRITUAL STRENGTH COME FROM?